74 pages. Hardcover with dust jacket. Text by Cary Levine in English and German. Published on the occasion of the exhibition ENDGAME, by Jenny Holzer. 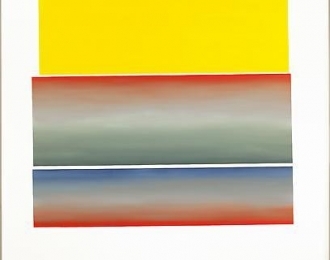 Thirty years after surrendering the medium upon her move to New York in the late 1970s, her return to painting is a confrontation with amnesia. During her search for subject matter for electronics and projections, she found a number of redacted U.S. government documents where little text is legible. These opaque documents became the grounds for the new paintings. Holzer’s newest series of paintings allude to the Suprematist works of Kazimir Malevich. Color, scale, and the mark of the hand are the only alterations that Holzer makes; the graphic geometric shapes are the censor’s original marks. The surviving text is original. 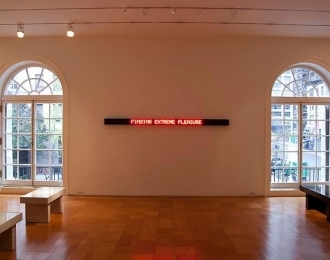 Holzer’s subtle alterations exacerbate how much one isn’t allowed to see.